It’s been awhile since I sat down to write a newsletter and a lot has happened. If you are living in Hawaii or Costa Rica, in the second week November it suddenly turned to winter. One day we got about 6-8 inches of snow. Daytime temps dropped to the 20s. Night time temps are 0, +/- a degree or two. A very dramatic change in the weather. The first week of the month there was no snow and it was not getting below freezing at night. Back in the middle of October Mary and I took our ’67 Volvo station wagon up to the North Shore for a few days. We were only gone for three nights but it was great. The first day was sunny and warm so we hiked to several waterfalls in State Parks up the shore from Grand Marais. The next day was rainy and cool. Perfect for bumming around Grand Marais and sitting by the fire at the cabin. It was a great little get away. Since then it has been pretty busy. Noelle minded the farm while we were gone. 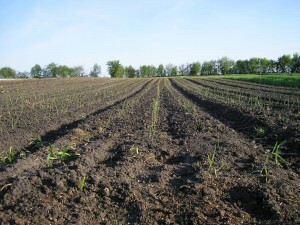 Andrew was over in South Dakota planting 20,000 (or some such number) bulbs of garlic. And then they were off to the North Shore and helping Bud at the meat market for deer season. With the sudden snow cleaning up and putting away all my toys made for a few hectic days. Batteries got charged, oil got changed, equipment was shuffled around to fit in the shed. Besides the snow, the bottom was falling out of the thermometer so the well and waterlines needed to be blown out, hoses drained, potatoes, carrots, and other root crops moved into the root cellar. Not everything got done. It was close, but I did not get any collards harvested for us and did not get any of the kale or collards dug up for seed production next year. The collard seed may be an issue. It is a several years old and the germination is starting to drop off. Other than the Lacinato, the kale produces seed like some giant weed so there is plenty of that. Deliveries for the season just wrapped up with the last few pumpkins going to our restaurant and co-op accounts. Now I can get started on my winter to-do list. Wire the root cellar. I have pulled the wires through 35 feet of conduit already and installed a temperature and humidity sensor. It is really interesting to see what happens to the humidity when we get below zero temperatures. The temperature changes very slowly. I need to finish the wiring for lights, a fan, and possibly a heater. Reassemble the Norton. This bike (1970 Norton Commando) was take apart a couple years ago to straighten a bent frame. The frame was straightened last winter and now I need to reassemble the parts. Build bean roller. This is a machine that consists of two inclined cloth covered rollers that clean broken beans, twigs, unthreshed beans, etc. out of dry beans. The rough edges on the bean trash get caught on the fabric and are thrown over the side. The smooth beans travel down the incline and off the end of the rollers. Build barrel washer. I have a small barrel washer that needs to be replaced. A barrel washer is a rotating inclined barrel that is make of closely spaced wooden slats. Root vegetables are dumped in the high end of the washer, sprayed with water, and tumbled to clean them. They gradually work their way down the incline on drop out the low end. Spread compost (not going to happen…). 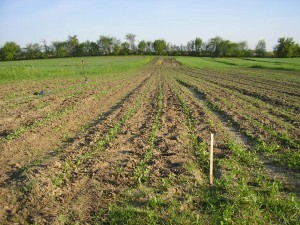 The wet spring prevented me from getting the second phase of my green manure program planted. 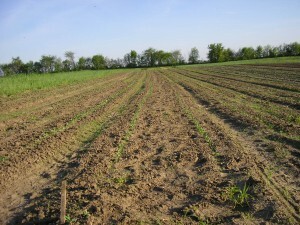 Not to mention that the winter squash went into part of that field also on account of the wet conditions. I bought 200 cubic yards of compost to replace the nutrients and organic matter that would have been produced by the green manure. Unless we get a big warm up the compost will not get spread until next spring. Thresh beans and sunflowers. Part of getting ready for snow was to pull up the beans that will be saved for seed or used for dry beans and store them in the greenhouse. They are still in there, leaves, vines and all. For small quantities like this I usually spread them on a tarp and drive over them. With the snow on the ground it is a little harder to thresh them and keep them dry. The sunflowers are a link in the process of experimenting with growing pole beans on a large scale. Package saved vegetable seeds. All the tomato, pepper, eggplant, and squash seeds that were collected in the fall need to cleaned and packaged for storage. ’67 Volvo wagon. This car needs all new rubber gaskets around the doors. The cargo area window gaskets are leaking but the word is that the ones currently being made don’t fit. I’m also going to pull the cylinder head off and see why one cylinder has higher than normal compression. There are a lot of minor things that need doing as well. ’92 Volvo wagon. My ’87 wagon is rusting away at an alarming rate. This ’92 is fairly clean, but was given to our daughter as a parts car for her sedan. She needs a parts car like we need another winter like last year. Needless to say it will require more than a little attention before it is a reliable daily driver. Radiant heat. Our kitchen floor is always cold and using the wood stove fools the thermostat for the furnace into thinking the house is warm. That saves a lot (25% or more) of energy but leads to a cold kitchen. Radiant heat is also energy efficient and keeps your feet warm. The floor joists below the kitchen and downstairs bathroom are exposed so it will be relatively easy to install. Of course there is wood to split, snow to plow, customer meetings, conferences and all those regular things that take place in winter too. It has been chilly the past few days, but weren’t the last two weeks just spectacular ? Weather like that is why people live here. Friday was rainy and raw, but since the wind has died down it has not been too bad, a lot like October. The forecast is for temperatures to be a little below average for the next few days, a reminder that winter is coming and it is time to get busy cutting wood. It has been nice to have a fire in the woodstove for the past few days. The growing season is obviously coming to an end. Last weekend about 15 people showed up for the final crop mob of the season and harvested a couple wagon loads of winter squash and pumpkins. We unloaded the wagons in the greenhouse before lunch. It was very warm which made working outside pretty enjoyable. After lunch (provided by the Birchwood, thanks Tracy) everybody was beat and went home. Ginger and Mark made it as far as the gas station, turned around and came back. They thought there was just too much squash lying on the ground and offered to help pick it up. We filled another wagon with pumpkins and then called it a day. We harvested the rest of the winter squash on Wednesday. With a little careful stacking it all fit in the greenhouse. It was good to get it out of the field. The forecast had dire predictions for lows in the high 20s to very low 30s for this weekend. 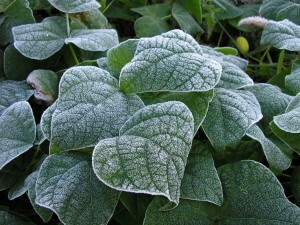 If the temperature drop below 28º squash in the field would be damaged. As it turned out it has not been as cold as predicted, but it was not worth taking the chance. On Friday the forecast was still calling for a freeze so the crew ( Zach was back for a few days between jobs) harvested peppers and eggplant to keep them from being ruined by the expected freeze. I hear it was a miserable morning, rainy, windy, and cold. We have only had frost the past few nights (lows up by the house around 32º) but it would have been enough to ruin the peppers that were exposed to the sky. In the afternoon we pulled up all the tomato stakes. It was much easier pulling them out than putting them in. Yesterday afternoon I mowed all the tomato vines and weeds in the winter squash. I had an odd mechanical failure while mowing. The tractor quit, just like it had been shut off. That usually indicated an electrical problem. It turns out that the spring for the ignition points snapped. 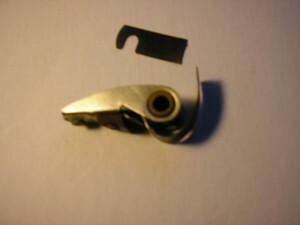 The spring is the electrical connection between the coil and ground. No ground = no collapsing magnetic field = no spark. Replacing the moving half of the points fixed the problem and the tractor fired right up. Today I disked the winter squash and the heirlooms. Andrew had broadcast rye and vetch over the tomatoes and squash a couple weeks ago. Only the rye in the mulched tomatoes has come up yet. In the unmulched tomatoes and squash the seed is mostly just lying there. Disking those areas will get the overseeded rye into the soil and get it to sprout. The neighbor has been hauling in loads of composted cow manure from the SMSC Compost facility. It looks and smells like black dirt. The compost will be spread in the field that should have been in the second green manure phase this year. It doesn’t completely replace the green manure, but it certainly helps. We will start spreading it this week and keep seeding cover crops. The days are getting short and winter is coming. Don’t forget about our fall potluck on this Saturday October 11th. We will gather around 2 and plan on eating about 4:30-5:00. We are planning to do pumpkin carving and a hay ride. We’ll have cider available, but if you want something else to drink feel free to bring it. We had our first frost of the season this morning. It was 32º at the house and colder out in the field. Up here everything was pretty frosty. Down in the field things were kind of frozen. The mustard and arugula leaves were very solid. Most of the tomatoes were ruined. They are the very sensitive to low temperatures. Even a light frost will burst the cell walls under the skin and form a ‘bruise’. I don’t know what causes it but once they have been frosted the flavor changes and it is not the same as freezing tomatoes to preserve them. Well, the tomatoes got frosted pretty hard this morning, The greenest ones fared a little better, but almost all the leaves are shot. It will take a few days for the plants to decide if they are dead or not. 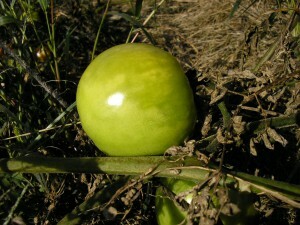 If they survive the green tomatoes will ripen if the weather holds up. This tomato will not make it. The dark area on top was frozen. The peppers and eggplant held up pretty well. There is a much better leaf canopy on the plants, compared to the tomatoes. The fruit is also much more solid so it takes longer to freeze. I’m sure there will be some losses, but we never get 100% of them anyway. The squash hate any frosty weather. It does look like we will have a good crop of winter squash. 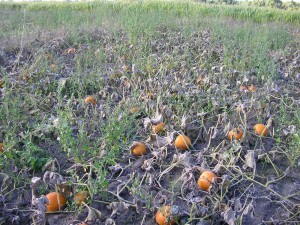 Most of the squash appear to have matured before the low temps killed the plants. I think a little frost improves the flavor of the squash, making it a little sweeter. The beans up in the seed garden did alright. The top leaves are just lightly toasted. The ones in the field are worse. It did not get cold enough to kill the corn crop, but unless a miracle happens it won’t mature. The largest ears are in the dough stage, but not showing any color. The radish leaves look like they were scorched by the low temps. The roots are probably the best they have been all season, but the bad leaves make them a tough sell in the co-ops. Turnips are unaffected by the cold weather. The afore mentioned arugula and mustards looked fine this afternoon. Sometimes it takes a day or two for the damage to show up. Yesterday afternoon we pulled up all the shallots and put them in piles. 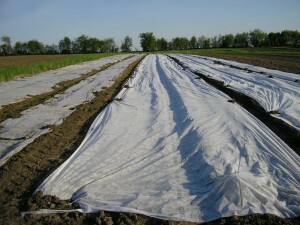 We covered the piles with two layers of tarps to keep the shallots warm. Freezing temperatures and onions do not go together very well. This morning it looked like they had all survived the night in fine form. The cabbage and kale get better in this weather. They think that they are going to survive until next spring and go to seed. The low temperatures cause the starches to start turning into sugars, creating a natural antifreeze. Little do they know that we have other plans for them. By the smell of the winter squash in the oven, it is getting to be time to eat. Well, I’m back. If you didn’t notice, I was away for the past couple weeks. If you didn’t notice, you will know that our crew did a great job while I was away. Things looked great around here when I got back. I have a collection of motorcycles and they do me no good in the winter. I like a summer vacation. This was a year for a bike trip. My default trip is out west and usually I take my ’70 Norton Commando. This winter I had straightened the frame on the Commando and ran out of time to put it back together. My ’82 Honda Silverwing (GL500, not to be confused with the new scooter with the same name) got the call. This is the only bike that I have ever bought new. The Goldwing is Honda’s top of the line touring bike. Now they are 1800cc, 900 pound two wheeled Honda Accords (it has a bigger motor than my Civic). They are great bikes. For $24,000 they should be, but not my cup of tea. Back in the day, I figured that the Golding was Honda’s take on a BMW and the Silverwing was their idea of what a Moto Guzzi should be, but still a bit of a rolling physics experiment. The GL500 has a 500cc engine in what used to be a full sized motorcycle frame. The bike weighs about 500 pounds and is pretty manageable even if it does not have a reverse gear. This year has had its share of farming challenges. Last year did too. Lately it seems like I have been trying to manage chaos, working from crisis to crisis. Exciting, but really not that much fun, and very hard to plan for. It was a good time to get away and see a bit of how the other half lives. As we worked our way towards Brookings, there were a lot of fields that were not planted this spring. As it turned out, over half a million acres in Minnesota were too wet plant. They were either weeds or cultivated fallow. As we got farther west more fields were planted, but they still had big areas that had been drowned out. Into South Dakota the corn looked better, but the soybeans were still pretty tough looking. As we crossed the Missouri the landscape turned to desert. There is a lot of desert out there. And it was hot. Steve’s bike ( ’89 Honda Transalp) started to misfire and eventually would quit running all together. We checked the power and grounds ( somewhat loose) and eventually replaced one of the CDI ignition units. It did not help. I think he has a bad coil pack. After a beautiful run down from Green River Wyo. Into Vernal Utah his bike ran okay. Once it got hot going into Duchene, it started to misfire again. He was going to look at the land the next morning and I was looking at the map. Fiddling with his bike had eaten up a couple hours each day and at this point had cost us most of a day. Sequim Washington is about 1100 miles from Duchene Utah and I was planning on being there in a couple days. Steve was thinking about visiting his son and son in law near Leavenworth Washington on the way back. And he would not be back from visiting the land until at least 1 on the afternoon. It was looking like either a pair of 500 and 600 mile days or 400 and 700 mile days. Neither were very likely nor sounded like much fun starting in the afternoon. I proposed meeting him in Leavenworth on Sunday. By morning, he decided his trip was over and was going to head home. It was a long interstate run to Olympia WA. 101 North was a beautiful trip. It should have been the height of tourist season, but the roads were deserted. It put a smile on my face and a little more tension on the throttle cable. My destination was Nash’s Produce in Sequim Washington. 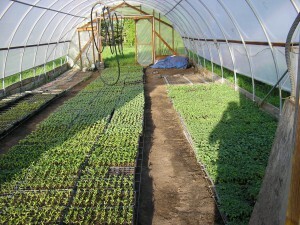 Nash grows a lot of vegetables, small grain and organic vegetable seed. The northern shore of the Olympic peninsula is the perfect place for growing brassicas, carrot, beet, kale, lettuce seed. It rains in the spring and then stops. The winter temperatures are typically close to freezing. Until recently any way. Now it has started raining in September, just when they are trying to harvest their vegetable seed and small grain. Not to mention that last winter was exceptionally cold and damaged many of the over wintered crops. It was a very interesting visit. I spent almost an entire day there. John Navazio is an organic seed breeder with the Organic Seed Alliance. He spent a couple hours showing me his test plots of spinach, onions and carrots. He is most interested in a purple sprouting broccoli. It is hardy enough to survive their winters and produce in April. I don’t think it would work the same way here, but it was fascinating hearing about how he selects for disease resistance, plant stature, winter hardiness, taste, and storage. All at the same time. It takes years of selection to produce a new variety. On my way south I stopped at Midori Farm. They have been farming for several years and had just bought a new place on some of the best soils on the peninsula. I helped out harvesting and cleaning crates while Marko and I talked shop. They were in the middle of a heat wave and crops were coming in much earlier than usual. There were no tomatoes grown outside, they were all in hoophouses. The last farm visit I had planned fell through. The guy was going to the Oregon Country Fair. I had been hearing about it since Idaho. I had to see it for myself. It cost $42 to get in and park. This was clearly a big deal. Except there was nothing country about it, lots of crafts, tie dyed clothes, and ceramics with several music stages. The site was huge. It clearly was not the west coast version of the Common Ground Fair. It struck me as the Renaissance Festival for Hippies, but without the turkey legs. I’m obviously missing something because 40,000 people go through the gates in three days, but I don’t get the Renaissance Festival either. There are some great roads between Oregon and here, but I’m not going to tell you about them. Once I was back the crew graciously let me take a few more days off to catch up on things that I should have been doing instead of wondering around the country visiting farms. 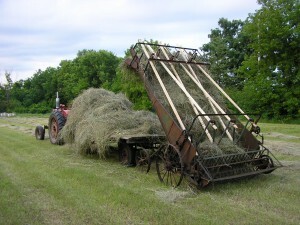 In the days or horse drawn agriculture there was piece of equipment that picked up loose hay and piled it on a wagon. Loose hay works great for mulch. I can just throw it off the wagon and skip the step of breaking up hay bales. A few years ago I found a hay loader that was in fair shape but needed the wooden parts replaced. It took a coupe days to get it back into working order. Now when it is too wet for my neighbor Norman to make hay I can cut and pick it up for mulch. Even if the hay isn’t dry it can be picked up and spread as mulch. This year the weeds in the tomatoes got ahead of us because we had the tomato stakes in before it was dry enough for Norman to make any hay (for mulch). 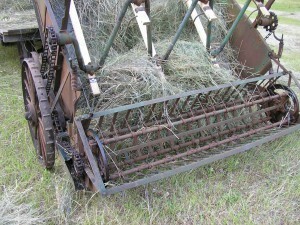 Here is a picture of the business end of the hay loader. The teeth on the very back rake the hay ahead until there is enough that it caught on the tines that are attached to the light colored wooden bars. The big crankshaft with the bars turn ‘backwards’ and the tines push the hay up the inclined bed. It is a very cool machine. Suddenly it is summer. I think every tree we have is flowering right now. It is great. People are thinking about gardening and we have been selling vegetable plants like crazy. On Saturday Tracy let me sell veggie starts in front of the newly reopened Birchwood. Andrew was selling them in Delano. We had a great day. Mette will be at the Birchwood this morning selling tomato, pepper, and eggplant transplants again. Thanks Mette (and Tracy). Andrew, Charlotte, Hannah, and Noelle have repotted all the tomatoes, peppers, and eggplant into 1½ X 1½ inch pots for the final grow out before they go into the field. It took a solid week of greenhouse work. The greenhouses are starting to clear out. At least there aren’t any trays on the floor any more. All the potatoes are planted. This year we are trialing a new variety from the UofM, MonDak Gold. Since all the potatoes in America are eaten as french fries or potato chips, that is what Christian Thill gets paid to work on. These spuds are good fried ( cut into wedges, tossed in oil and baked in the oven), on pizza, or baked. 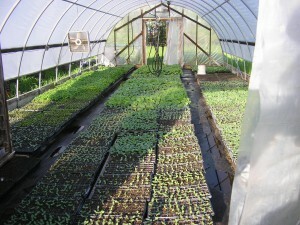 About half of the cabbage, kale, broccoli have been transplanted. We used the two row transplanter. It is everyone’s favorite machine once they get good at operating it. About half of the lettuce is in. All the onions have been set out. There are many fewer onions than last year. I have never had great success with onions so I’m having Jerry Ford grow onions for me. On Thursday the first zucchini went out. They had to go in three different places to find enough space. The deer will eat all the lettuce unless we keep it covered. Direct seeding is kind of keeping up. The wet weather has limited the places that I can go with the tractor and consequently is causing some back ups in stale bedding (early cultivation to let some weeds come up before a crop is planted) and planting. At this point, the forecast is backing away from rain in the short term. Actually, we need rain. We don’t need a thunderstorm and diownpour. The trouble is that the big rain we had during the last week of April. It saturated the soil and there is no place for the new rain to go. The rain we have had since then has been 1 – 1½” per week, just the right amount. As the temperature has warmed up there has been more evaporation and the rye cover crop is really growing again, both are helping get rid of the some of the excess water. The river is still much higher than it was when the ice went out. Our neighbor’s hay fields look great but no one has planted any corn yet. Norman was just able to get into the driest parts of his fields on Friday. Usually corn planting is done by early May (treated seed doesn’t rot in cold soil) and soybeans are planted mid to late May. It is getting late to plant corn. They will see a yield reduction for every day planting is delayed after May 1st. 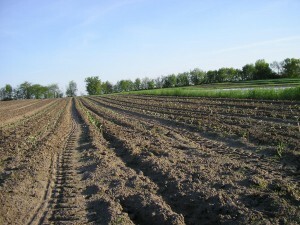 Planting at the end of May cuts their production by about 20%. The big farms that benefit from subsidies and federally paid crop insurance programs will probably decide not to plant any corn if they can not get in today. It is a silly system. Typical corn yields in Wright County are about 180 bushels per acre. 80% of that is still 144 b/A. It would seem worthwhile to me but with they will make more money taking the crop insurance. As much as the Corn Growers talk about ‘Feeding the World’, it is really the money that matters. This is a point to remember the next time you hear someone talking about how much GMO seed and technology is needed in production agriculture. As an aside about GMOs: I see in today’s Strib that I should be able to cross tomatoes and fish, or bacteria and corn. I am so deeply disappointed. I’m such a slacker when it comes to selecting and saving seeds. Where do they come up with this crap ? And of course, why do they print it ? Our neighbors have dairy cows so they will still plant corn. They are not just growing yellow stuff to put on trucks and send off the farm. Besides picking ear corn they chop a lot of green corn for silage ( kind of sauerkraut for cows ) and use that stalks for bedding. It is interesting to compare a real family farm that grows crops and milks cows to the industrial scale farms that produce the vast majority of milk in this country. Norman, his sons, and grandsons do all the work on their farm. They grow their own feed, make hay, milk the cows, clean the barn, spread the manure back on the fields, rotate their crops. I’m very sure the owners of Metro Dairy would be able to identify a cow. Everyone thinks their milk comes from farms like Norman’s. Okay, I gotta go. I’m going to seed a few rows of radishes and arugula and work up some ground for tomatoes. 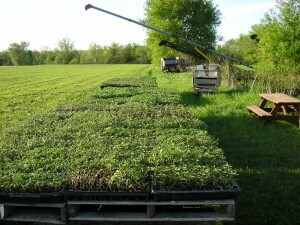 The first crop mob on Saturday will be planting them.